One of the biggest unknowns for those in Seminary is “what will my future income be?”. Assuming what your income will be might be more dangerous than not knowing. Why is this such a big deal? Because many assume when it comes to debt they can ‘kick the can down the road’ and deal with it once they have a large income. A doctor or some other profession with a large potential earning power might be able to get away with this strategy, but even then its not wise. Those in ministry face a more acute risk – their future earning power isn’t unlimited. 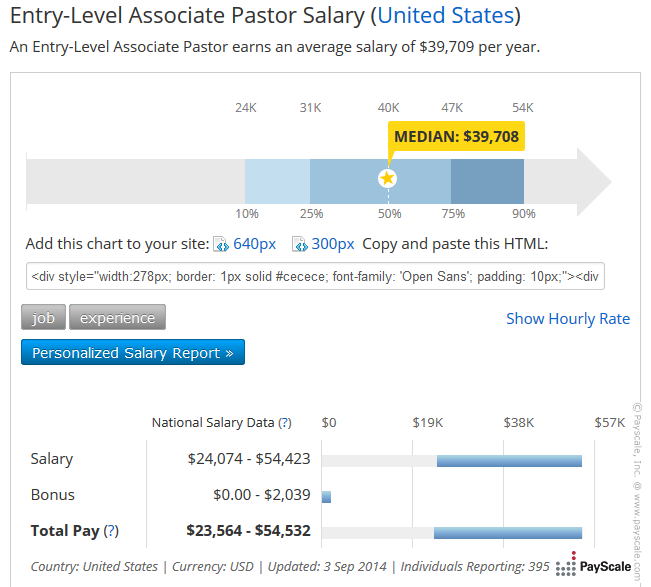 There are a few tools online that help give signposts on what future income an associate pastor can expect. Anecdotally through my former career as a mortgage loan officer, I’ve also met with many in ministry and gone through their financials so I have a very good idea of what clergy at different sized churches are actually earning. My educated guess, based on research and experience, is that someone going into ministry will earn $30k-$48k as a starting income. Those that fundraise their own positions (such as those in Cru) will experience a wider array of income scales as well. Part of the issue with way our minds think about money is this: Our brain has a very difficult time projecting what living on a certain income (say $48k) will actually be like. While $48k seems like a good income to our minds, once we actually start penciling out the budget, it doesn’t go quite as far as we might think. Add into the equation a bunch on student loans and it gets even dicier.